If you’re serious enough about your wine to get a wine cooler, then we’ve got some more tips & hacks for you to take your collection even further. Investing in a wine cooler is the best thing you can do for your wine collection without building a dedicated cellar. If you normally have more than twenty bottles on the go and plan to collect more, you really should consider getting one. Why stop there? Here are some tips on how to keep your wine cooler working at full capacity and some tips on how to get the most out of your wine. There’s a few things that you should consider and do to make sure that your wine fridge is firing on all cylinders. The positioning of your wine fridge is really important. If your unit has front ventilation, it can go pretty much anywhere. You can also fit these so that they are flush with the cabinetry. Best practice is to leave an inch free on the sides, a couple on top and few at the back to make sure that it’s getting the right ventilation This especially needs to be done if it is not front ventilating. Figure out whether you should get an integrated or freestanding model by checking out this helpful guide. Make sure it is out of direct sunlight, otherwise it’s going to have to work overtime. Wine is also very susceptible to heat and UV rays. For the same reason, don’t place your wine cooler near any appliances that emit heat. Here’s our article on where the best place is for your wine cooler. 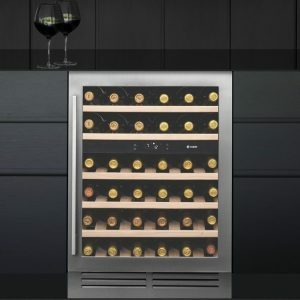 Installing a wine cooler is really easy, it’s mostly a case of having a clear route to a power supply and being able to open the doors fully. You need to make sure that the shelving is level, so the bottles don’t roll around. You really don’t want them to roll out of the cooler and smash when you open the door. Leave it to stand for a couple hours before turning it on and make sure it’s been properly grounded. Unplug the unit and remove all the contents including the shelves. Put your wine collection in a dark, cold part of your home whilst you clean. Simply take a clean cloth and wipe down the interior. Pay attention to what you find in case there is a recurring problem. Let your wine cooler cool down again before reinserting shelving and bottles. If your wine cooler has a carbon filter that protects your wine against odours, these can become clogged after about six months. Make sure these are changed out. Wine coolers are really low maintenance, giving it a wipe down and changing a filter every 6 months isn’t much at all. Take note of the capacity of your wine cooler and do not exceed this. Capacity is based on 750ml Bordeaux-style bottles of wine. If you’re storing bigger bottles, you need to consider this. This is also why you shouldn’t buy a wine cooler that only fits your current collection unless you’re committed to keeping your collection at the same size. Staying within capacity will make sure each bottle is at the right temperature for serving and for storage. Now you know our tips for the best way to store wine in your wine cooler, what about the wine itself? We’ve got some hacks and tips below for you to get the most out of your collection. Keep your wine cool by using frozen fruit like grapes or wine cubes. Pour wine into an ice tray and let it freeze for 48 hours. Say goodbye to watered-down wine. If the cork has broken into the bottle, use a coffee filter to salvage the bottle. 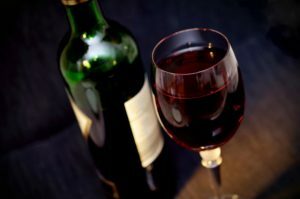 Get rid of red wine stains by using salt and baking soda. Save all your leftover wine to cook with. Make red wine grilled cheeses, throw it in a pasta dish or pair it with some cheese. When packing a bottle of wine to take somewhere, put it in a large sock for protection. Not satisfied with a bottle? Use it to make cocktails instead. Don’t let a bad bottle of wine ruin your fun. If you don’t own an aerator, simply put your wine in a blender. Put it on high speed for 30 seconds. No corkscrew? No problem. You can open a bottle of wine using your house key and even a shoe. Need to quickly chill a bottle? Wrap a wet paper towel around it or linen cloth and put it in your freezer for 20 minutes. If you commit these wine hacks to memory, you’ll run into very few problems with your collection. With a wine cooler, you’ll be able to serve wine at the right temperature every time and preserve it well. Wine was made to be enjoyed to the fullest and storing it in a wine cooler is how you achieve that. Where is the Best Place for your Wine Cooler?